On the 26th of September Macmillan Cancer Support invite their supporters to join them for a coffee. But it’s not just any coffee; this is the largest coffee morning in the UK and all the proceeds go towards supporting people living with cancer. 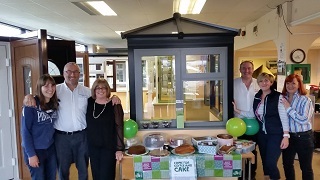 A fantastic cause that we don’t need encouragement to support but we do love a bit of cake with our coffee, so we donned our aprons and got baking. We held our coffee morning here at the Salisbury Glass HQ and asked everyone to bring tasty offerings to sell in the office. All the baked wares were absolutely delicious but we reckon that Bex's Gran has a touch of the Mary Berry about her, so special were her baked goods. Every last crumb was sold, and not just to Jake who we’re fairly sure ate the most cake (all in the name of charity though of course). At the end of the day we made a grand total of £108.00 (and extended our waistbands by a couple of inches too). Well done to Bex & Bex's for organising such a successful morning.